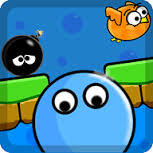 Pixelino is an addictive minigame similar to the classics Pixelmania and Coloroid. It has a single player mode and a multiplayer mode (2 players). The aim of the game is to capture all the fields on the board by changing their color. You start from the upper left corner. By pressing one of the color buttons you capture all fields of this color which are contiguous to the fields you have already captured. There are four different game modes. Challenge mode allows you only a limited number of moves to capture the whole board. If you have made all your moves and the board is not completely captured you lose the game. With Chill mode you can make as many moves as you want. The 2-Players mode enables you to challenge a friend who starts from the lower right corner. In this mode, it doesn’t matter how many moves are made: what counts is who has captured the most fields at the end of the game. Every turn you can only capture those fields which have not already been captured by your opponent. Both players take turns and the arrow on top shows whose turn it is. The same rules apply if you play in the Player-vs-Android mode. Game mode, board size and the number of different colors can be changed in the settings window.Supported languages for Pixelino are English and German.